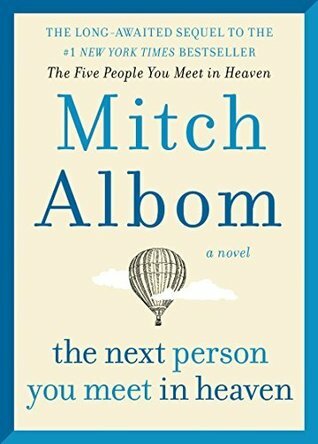 The Five People You Meet in Heaven has been a favourite book of mine since I read it over fifteen years ago. I can count the number of books that I reread on one hand- and The Five People You Meet in Heaven is one of them. The Next Person You Meet in Heaven is the sequel that I didn’t even know I needed or wanted. If you ever wondered what happened to Annie, the girl Eddies saves in the first novel, all your questions will be answered in this book. I was nervous that this book would not have the magic of the first book, but the magic was not lost. The story is moving and very bittersweet. This is a topic that could easily turn cheesy but in Mitch Albom’s hands it remains uplifting and charming but also has a lot of depth. I do not want to say too much because it is a sequel, but if you loved the first book I am confident that you will love this one as well. I was truly touched by it and reminded why Mitch Albom is my favourite author. I went to a Mitch Albom book signing and he is absolutely incredible. I do not think that there is a better speaker out there. I learned so much about him as a person and he really emphasized how all of these little things had to happen in order for him to end up where he is today. That is a major theme in The Next Person You Will Meet in Heaven. I tweeted about this but you know how people say never to meet your heroes? That was not the case for me. Mitch Albom is as fantastic as I thought he would be and many people in the room were moved to tears- including my dad. I went to the event with my dad, who is the person who put Tuesdays With Morrie in my hands all those years ago. It was even more special that I was able to attend with him. If you have never read anything by Mitch Albom, I truly think you should give one of his books a chance. They are short but powerful. Start with Tuesdays With Morrie and go from there! I have read all of his novels and there is not one that I wouldn’t recommend. This post sounds like it came from my own mouth! The Five People You Meet in Heaven has also been a favorite of mine for years, and I was so excited for a sequel when I heard about it. I think the time between the books is what helped keep the sequel so good because it wasn’t just pushed out for the sake of it. He had time to think on it and write it the way he does everything else. I completely agree. You can tell that he took his time with this book and didn’t rush it out just to make money. I have so much respect for him! You’re so nice! Thank you! I was thrilled to meet him and he is as wonderful as his books would suggest! Great post!!! I am dying to read his new book because I love pretty much all of his other ones. I’m really glad that you had a good time meeting him! He was brilliant! I love the thought that he puts in to his novels. I don’t think you’ll be disappointed. That’s so cool that you went to a signing and relieved to hear this was good- I really liked the first one! Great review! Thank you! I really think you will be happy with the sequel! So glad you had the chance to meet Mitch Albom! He seems like a great speaker from what I’ve seen of him online. I hadn’t known he was releasing a sequel to The Five People You Meet in Heaven, but I’m interested to read it now! He’s wonderful! I think you’ll enjoy the sequel. I was really impressed with it! I have read neither, but this post definitely made me want to read both books! Ah Noriko! I really think you will love this book! That is really sweet! Thanks!